My friend Joanie asked me if I would make up a batch of cupcakes from a box mix. She was curious about whether they would live up to the name associated with the high-priced mix. “Would it be the same if I made it vs. a professional chef?” she asked. Presenting me with the challenge of using a boxed mix I told her I would give it a whirl. Would I make any changes to the directions? Is it easy like baking from a box promises? 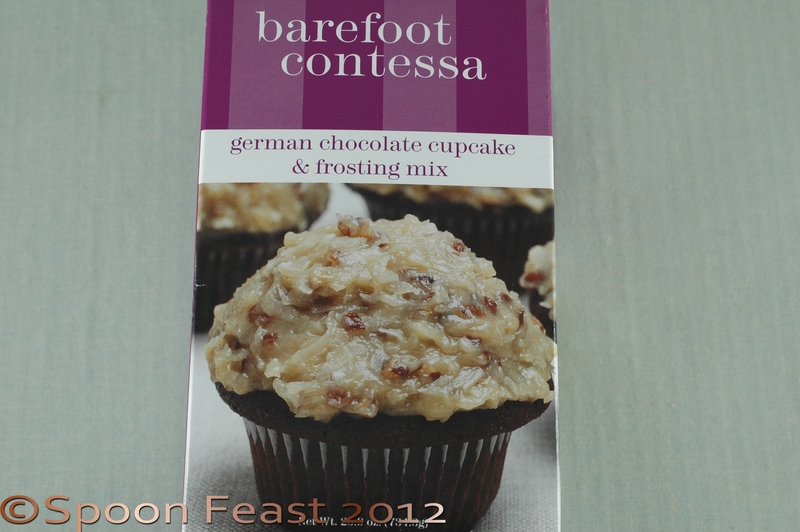 Are the results as promising as the names on the box: in this case, Ina Garten, the Barefoot Contessa and the German Chocolate Cupcake and Frosting Mix. The mix is distributed by Stonewall Kitchens although nowhere on the box does it say where the mix was put together. 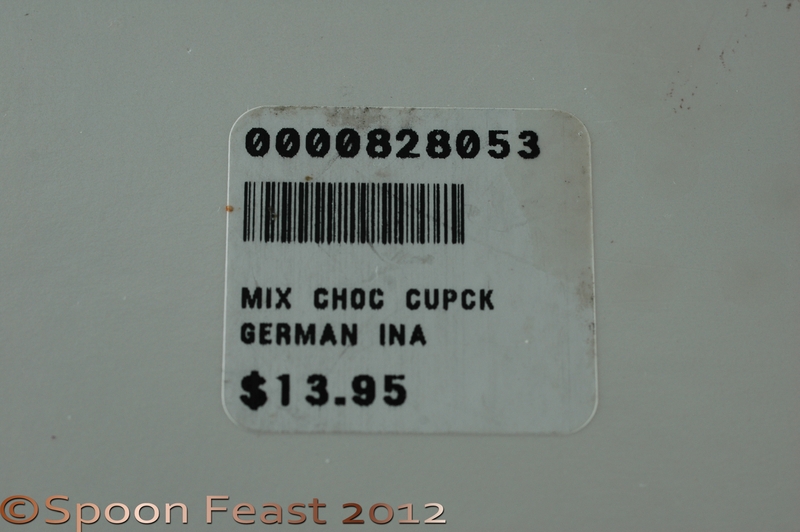 First, the mix costs $13.95 for 12 cupcakes. My first thought is “expensive”. Is it worth the money? I notice the frosting mix contains cornstarch which is something I wouldn’t use as in my opinion, it is a cheap way out of proper thickening techniques. But we will see. Inside the box are three bags: one contains the chocolate cake mix, another granular frosting mix and lastly, a small bag of sweetened shredded coconut. The directions seem to be simple enough, so I pull the eggs and butter from the fridge and go for a run while they come to room temperature. Instead of using plain cups for the cupcakes, I am going to use the fun flower ones I found out shopping one day. Fast forward to finished baking these. All I can say it they are definitely NOT worth the price, let alone the extra cost of a fancy paper cup. Not only did they not turn out, they were also hard as rocks one they cooled. They also had a funny smell as they were baking. 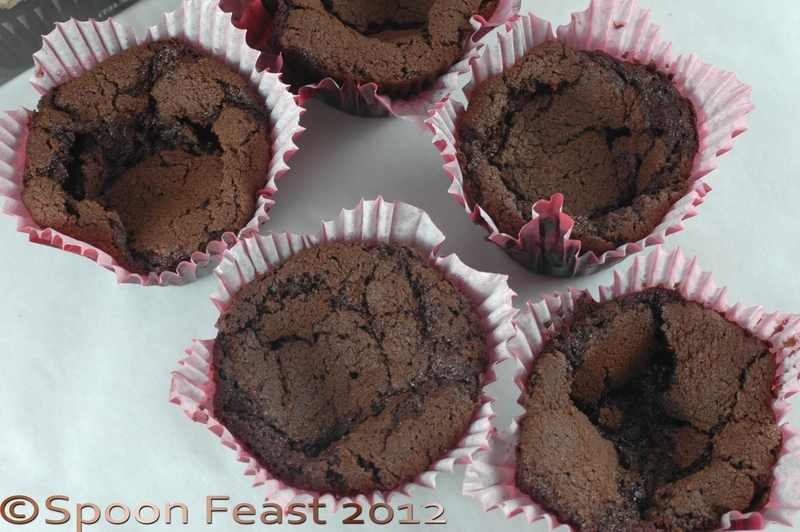 Usually when you bake chocolate, the aroma is thick in the air. The aroma from these had you checking the bottom of your shoes. Now after that fiasco, my curiosity was up, how would the normal cake mixes found in the grocery store work out? 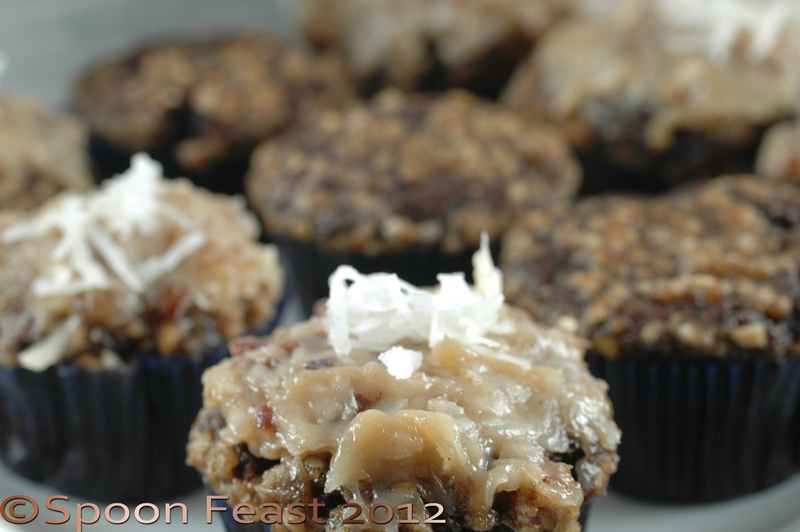 So I hauled up to the grocery and bought one of each kind of German Chocolate Cake Mix; there were three. So I made each of these mixes, each mix made 24, the expensive mix made 12. 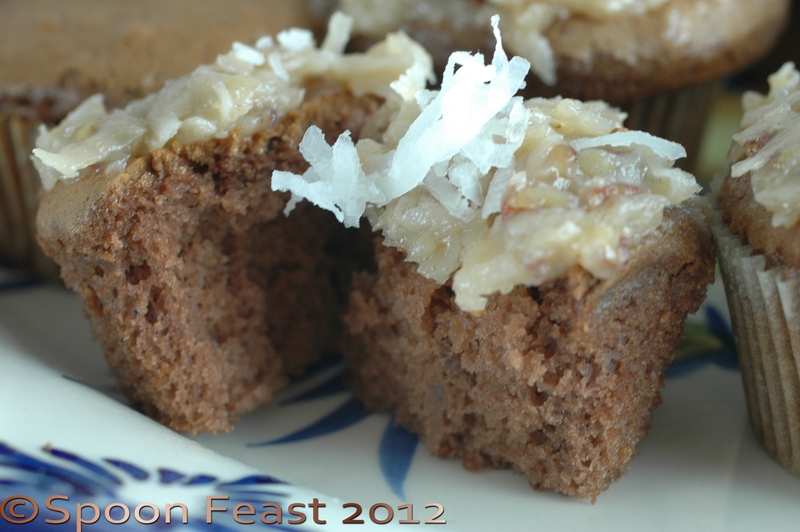 I made a quick coconut caramel frosting from scratch to frost the cupcakes with, and I used the frosting mix from Barefoot Contessa’s box. It was OK, nothing great and it looked rather dull. I’m wondering if they ever passed this box mix by Ina to see if she approved. I can’t imagine they did. 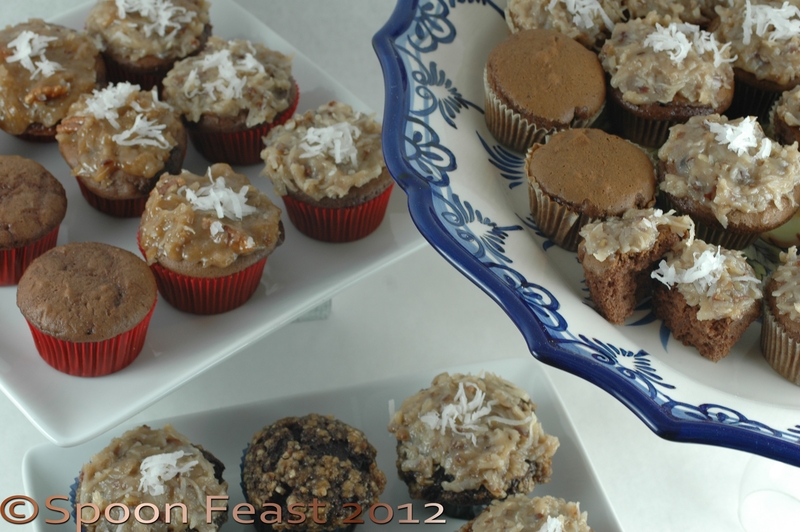 So at the end of the day, we had so many cupcakes and bowls of coconut frosting lying around, Robert was afraid of us eating them all. I wrapped plated of the cupcakes up in cellophane and sent Robert around the neighborhood giving them to all our neighbors. One little boy was asking his mom why they didn’t have anything good around the house to eat, like cupcakes, the night before. When he answered the door and Robert was standing there with an entire plate of cupcakes, all he could say was “Really! Thank you! Thank you so much!” Grinning ear to ear, he disappeared into the house with a plate of cupcakes. I could imagine him hiding them in his room so his older brothers wouldn’t get any. I love sharing the sweets I make because if I didn’t, #1, we would weigh as much as a horse, #2 I wouldn’t make them just because of #1. And I do love to make pastries, bread and lots of great food. Sharing it is the only way to keep from wearing it. As a side note, I did make macarons from the egg whites, I should have given away more of them. I need to add a few more miles to my running schedule. I did figure out that if you are going to bake cupcakes, forget the boxes and make the batter from scratch. It will be cheaper by far and you will know exactly what you are eating. My advice? Joanie, get your money back. If you want to use a mix Duncan Hines or Pillsbury or any of the organic mixes work just fine. My opinion is Contessa needs to go back to the kitchen to re-work her box mix. I never would have done this if Joanie didn’t ask. 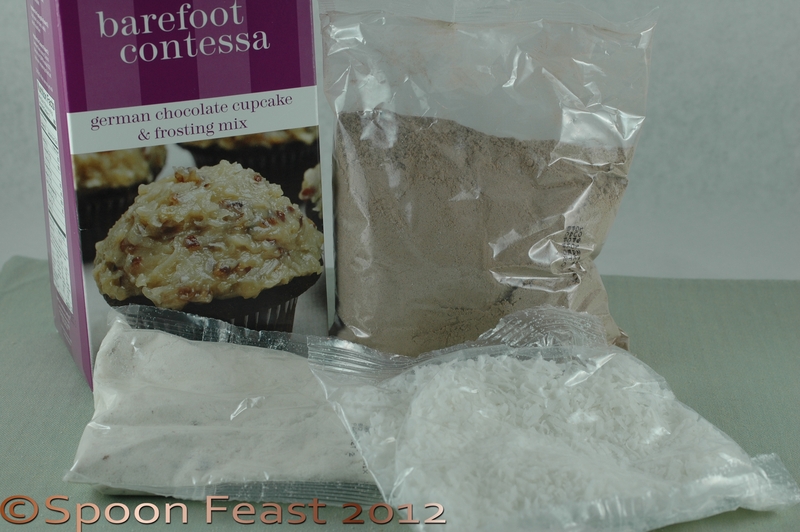 This entry was posted in Cooking, Cooking Thoughts, Recipes and tagged Baking, Barefoot Contessa, Cake, chocolate cake mix, chocolate cupcake, cooking, Cream, Cupcake, Duncan Hines, Home, Ina Garten. Bookmark the permalink. That’s the way to go Uru, make them from scratch, you are so good at it anyway! I have a mantra, “Never buy anything with a ‘celebrity chef’ name on it.” It is all marketing. Hope your studies are going well. Thanks for such an objective review, Pamela! I’ve never been a fan of box mixes anyway, nor really understood the need for them. They don’t really seem to save much time over simple recipes anyway? They take just as much time. But if someone really does not have the interest in baking from scratch, they should know an inexpensive mix will work for them just fine. Spend the rest of the money on champagne!